Suitable for dairy, hog, other livestock liquid manure, penergetic g acts as a catalyst to naturally create an aerobic condition in the slurry, activating beneficial microbes which transform the slurry into a nutrient rich organic fertilizer – which is far more beneficial than the more commonly occurring and problematic untreated (anaerobic) manure or slurry. Penergetic g is an economical, easy to apply manure treatment method (requiring no capital equipment) used by thousands of dairy farms in Europe, globally (and now popular in North America). * Also works well with flush barn set-up or when sand bedding is used. Application may be started at any time – when the storage tank/lagoon is all or partially full or after it is emptied. Initial use:For every 100,000 U.S. gallons (USG) of liquid manure/slurry to be treated, mix 8.0 to 16.0 lbs. of penergetic g with plenty of water and pour into underground pit, slurry tank/lagoon, effluent channels or into alley. Each subsequent application: Dairy: Add 8 oz. penergetic g per 45 livestock unit (LSU)** weekly or 2.2 lbs. 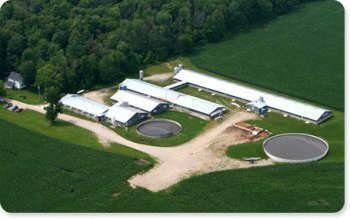 for every 25,000 USG of additional liquid manure/slurry generated into scrap alley / effluent channels / alley or underground pit or lagoon. e.g. : a cow = 1 LSU; heifer = 0.7 LSU; sow = 0.4 LSU; wieners up to 50 lbs. = 0.06 LSU, feeders: 7 = 1 LSU, etc. Mix penergetic g with plenty of water in a watering can and pour evenly over the channel or through slatted flooring. Best results may be achieved by pouring 2/3rds of the recommended dosage at the head of the channel. In barns with automatic alley scrappers, the scrappers will carry the penergetic g/water mix out with the slurry to the pit or tank. Poke some holes through the crust layer (or move the crust layer aside) and pour the mixture of penergetic g and water through these holes into the liquid layer of the slurry under the crust. For best results at the outset, pour the penergetic g/water mixture over the agitator while operational. If no agitator is available, puncture any crust layer present with a suction hose and introduce the penergetic g/water mixture through the hose. Pump sufficient slurry out of the tank or lagoon to fill the suction tank then pump it back into the slurry tank/lagoon. The idea is the get the penergetic g / water mixture integrated into the slurry as much as possible at the outset so as to ensure good results more quickly. In the case of large slurry tanks or lagoons, especially if a thick crust is present at the outset (dairy) or heavy sediment layer (hog), this procedure should be repeated at several locations around the structure. (Annualized) Swine: condition on type of operation – distributor can provide costing. Penergetic g uses a proprietary process which activates the aerobic microorganisms, stops the putrefaction process and stimulates the beneficial decomposition/rotting process. The daily problems involving slurry are familiar to any dairy or pig farmer: blocked effluent channels, floating layers and solidified sedimentation layers in the slurry tanks, the need for extensive lagoon agitation before applying the slurry, an acrid, pungent smell in the area of barns and pits, gas emissions during agitation and application of the slurry, burning and scorching of the crops after application and many other problems. Often despite the farmer’s best efforts, the slurry fails to produce the desired fertilizing effect. This leads to the application of additional fertilizers and other crop protection measures. Typically, slurry will become a problematic waste product when conversion takes place by means of putrefaction processes. This involves decay under anaerobic conditions, i.e. in the absence of oxygen. Anaerobic conversion of slurry leads to the development of malodorous gases, including hydrogen sulphide and ammonia, and (odourless) methane gas. Also problematic, the odour carriers in manure – indole and skatole (3-methylindole) – attract harmful insects. These insects lay their eggs in the slurry, and the subsequent larvae often remain in the slurry when it is applied on the fields, leading to crop damage and the need to apply pesticides. Furthermore, the valuable substance ammonium nitrogen is lost in the anaerobic slurry, because ammonium is converted into ammonia, through volatilization, and consequently is no longer available as a nutrient for plants. The conventional method of introducing oxygen into the slurry involves mechanical aeration by means of stirrers or compressors. However, this technical method becomes problematic when dealing with large quantities of slurry which cannot be stirred effectively every day. Floating layers then quickly form, further sealing off the slurry from the oxygen supply and thus strengthening the anaerobic environment. Also, the annual energy costs for stirring/agitation operations can be considerable. But there is another way! The simple and natural solution to turn slurry into a valuable organic fertilizer involves activating decomposition processes in the slurry which only take place with oxygen. The decomposition processes involve mould fungi, yeasts and many other microorganisms; include several biological processes which are absolutely vital to maintaining a state of equilibrium in nature. Mould fungi very quickly bind any ammonia which is present in the first stage of the decomposition process to form ammonium nitrogen, which is subsequently available to plants as a slow release source of nitrogen. The harmful and unpleasant biogases are also largely eliminated, providing for a noticeable difference in the pit/lagoon and during application. Healthy, decomposed (rotted) slurry thus constitutes an important element of a closed substance cycle management system which benefits the soil, plants, animals and humans alike. The best solution is a simple method which activates the aerobic bacteria while avoiding the use of external energy and other factors detrimental to the environment. Penergetic g possesses the specific active properties to reactivates the life processes in slurry. The putrefactive bacteria die and the oxygen which is present in the slurry is aerobically activated. An oxygen-producing and breathing biomass quickly arises. The micro algae which develop change the colour of the slurry to dark green and the work performed by the bacteria renders the slurry homogeneous. In the course of time, existing floating layers and sedimentation layers dissolve. As a natural side-effect of these processes, the smell is diminished. Using the decomposed slurry produced with penergetic g enables the quantity of commercial fertilizer used to be reduced. * (Optional) Complete the FMMC and submit by email or fax and receive a proposal (and cost) of using penergetic g at your operation.